Welcome to the OHF Design Lookbook where we feature some of our favorite projects! We hope you're inspired. Check back frequently, as we update this page with unique builds and our creative solutions. This elm and brown maple desk unit is a show stopper. The countertop, top boards of the two outer sections, and the bridge are built in elm and stained with Cinnamon stain. The remaining brown maple portion is stained with Rich Cherry. The left lower base cabinet has two pull outs to house the printer and other gadgets. All of the file cabinets have locks and there are four groups of lights, each with separate switches. 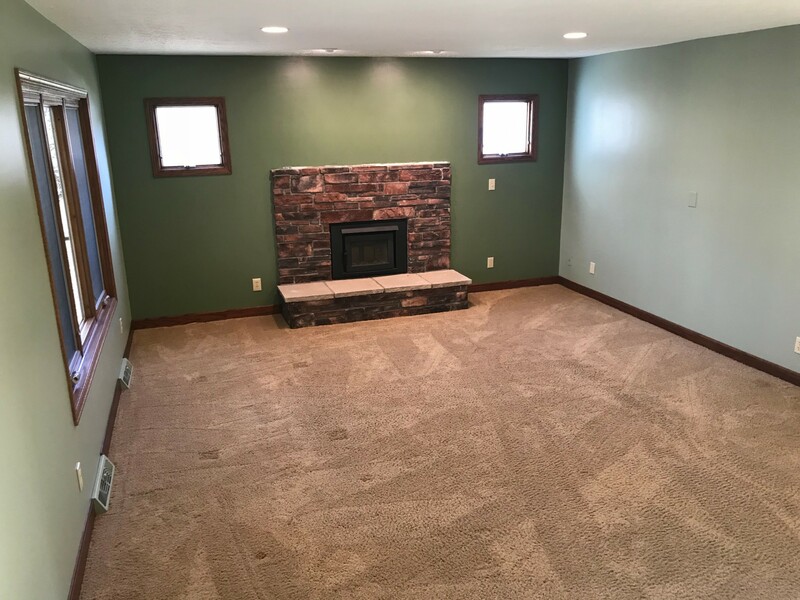 We love when we help a customer transform their entire space! We built their Brooklyn bedroom set in rustic cherry wood with Asbury stain. 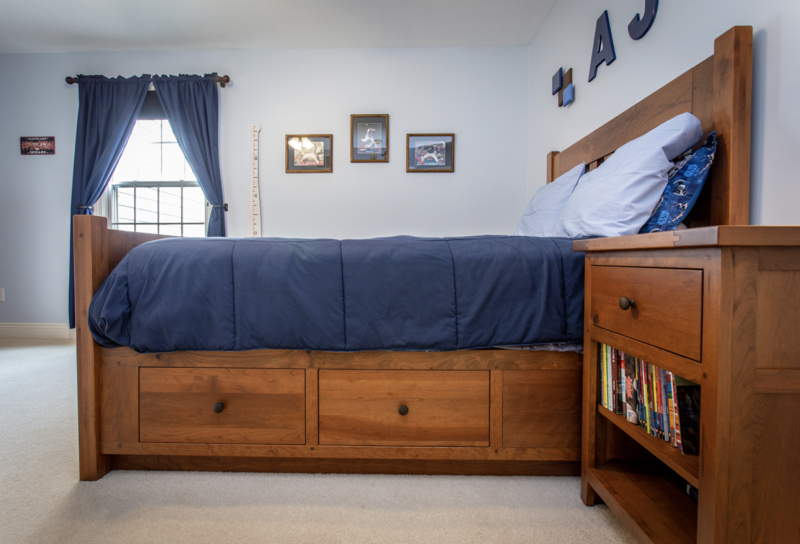 Their Lindholt bedroom set is built in elm wood with Michaels stain. And their Timber Mill bedroom set is built in rustic cherry wood with Sealy stain. 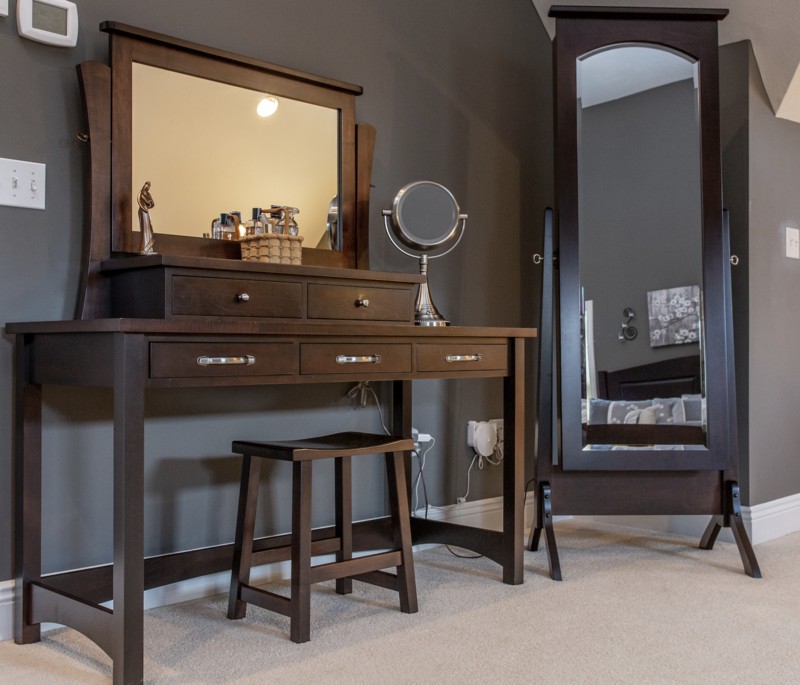 Our Classic Shaker jewelry cheval, dressing table and Destiny stool are elegant in brown maple hardwood and Java stain. In this bedroom nook we paired our Old Mission Ottoman and Garnet Hill end table with the Deerfield upholstered chair by Hallagan. Our Hillside Double Pedestal table is stunning with a red oak base (with Nora’s Grey stain) and rustic quarter sawn white oak top (with Michaels stain). Our Urbana arm and side chairs use the same wood/stain. And our Old World two door china hutch is red oak with Michaels stain. 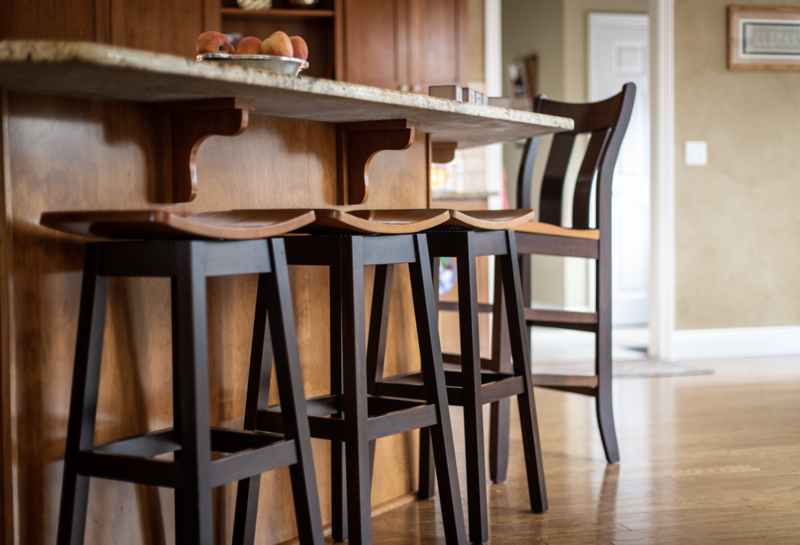 We built these Jackson kitchen stools with a brown maple frame (Rich Tobacco stain) and cherry seat (Natural stain). Because many of our pieces are built in-house, we are often able to accommodate clients' unique requests. In this case, we successfully adjusted the height of our Crescent Panel bed (below) to meet their needs. 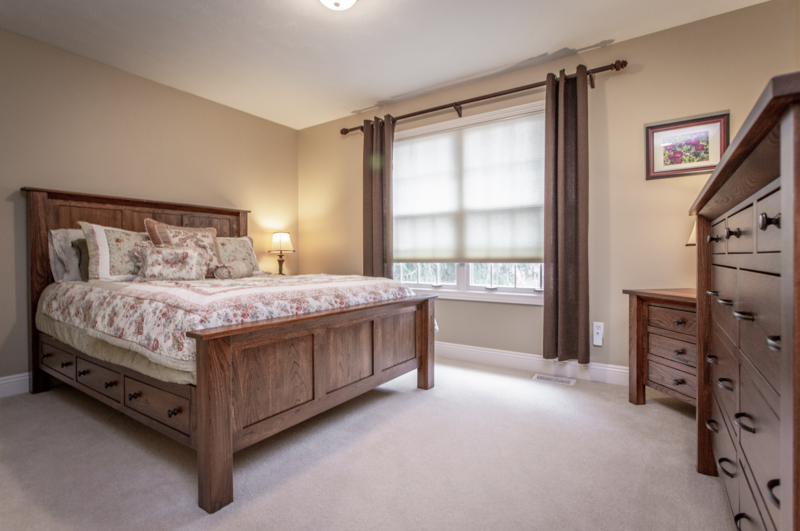 This bed, along with the coordinating nightstand, were built in rustic cherry hardwood. We were able to help our clients hide messy cell phone cables by adding our Charging Valet on top of the nightstand. We helped these clients create their design solution. We custom built their cherry kitchen cabinets along with several other pieces, like these rockers, pictured below. The cabinets' interiors are made of maple. We gave the upper corner cabinets glass doors and glass shelves, along with recessed can lighting. All of the other upper cabinets have wood shelves. The space is beautiful and functional! 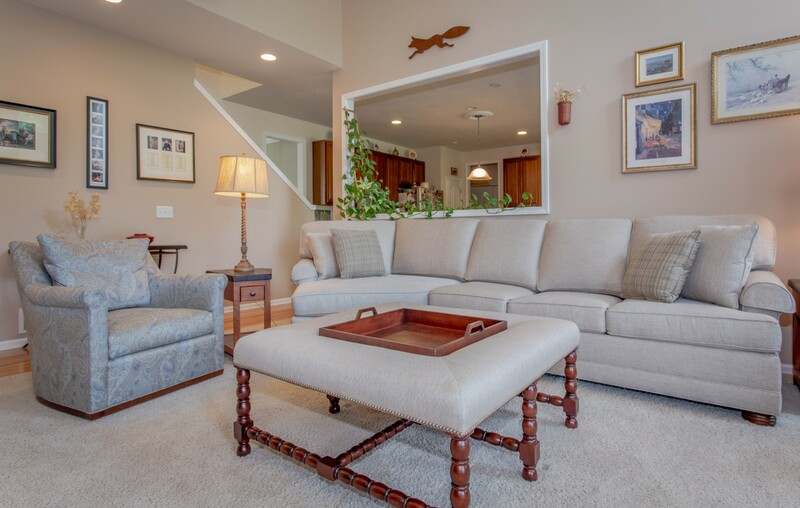 These customers love their refreshed living space and the new harmony between custom wood and upholstery. 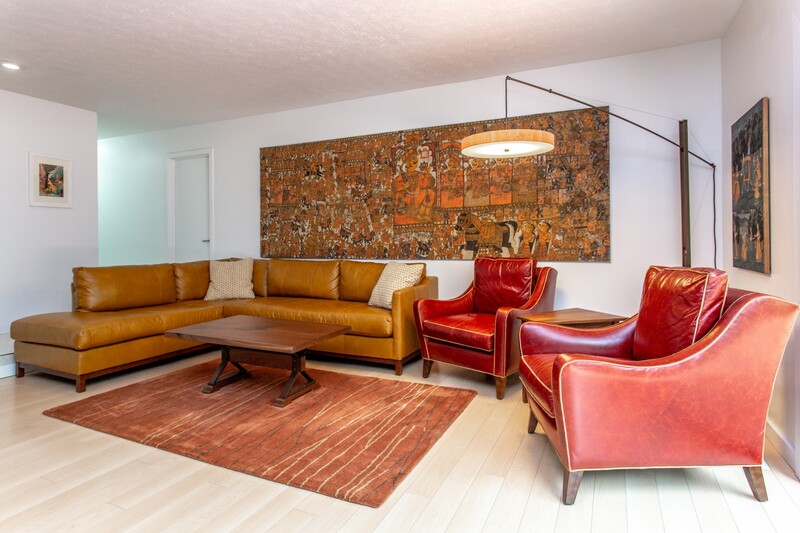 We paired our leather Ryan sectional by CR Laine with two stunning red leather 568 chairs by Our House Designs. 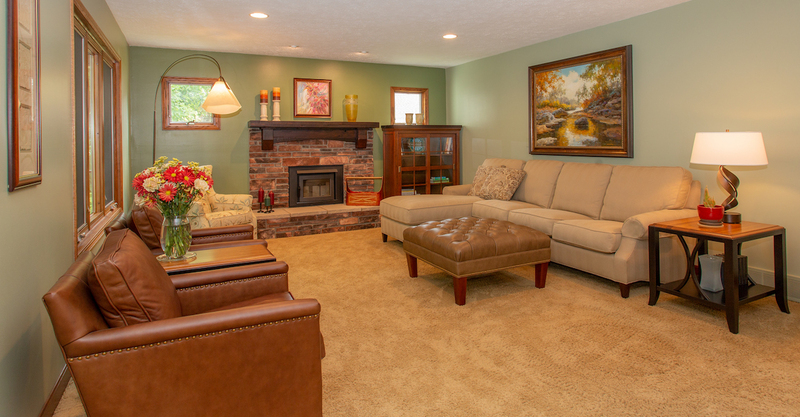 All Ohio Hardwood Furniture's upholstery is hand crafted, American made. This spectacular American-made Disq Arc floor lamp by Hubbardton Forge lights up the Shaker wedge end table and live edge coffee table we built in-house. In this space our clients customized their Temple Tailor-Made sectional as a sleeper sofa with end wedge. They made it their own with choices like a loose back, sock T cushion arm and spindle bun foot. 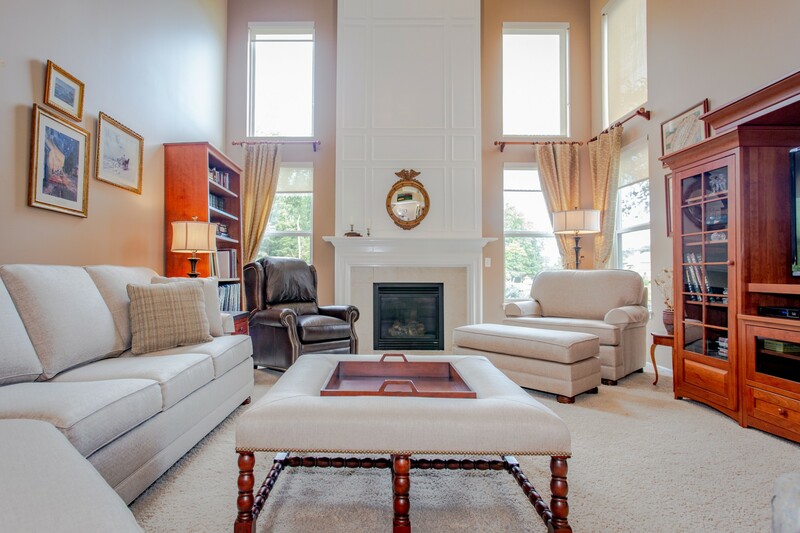 Their coordinating oversized chair and ottoman is nicely offset by our Wesley Hall Houston swivel chair. Creating a distinct look, we used rustic cherry hardwood with a reclaimed top for their Frontier end tables (built in-house). And this show stopping cocktail ottoman and leather recliner, both built by Our House Designs, complete this design solution. 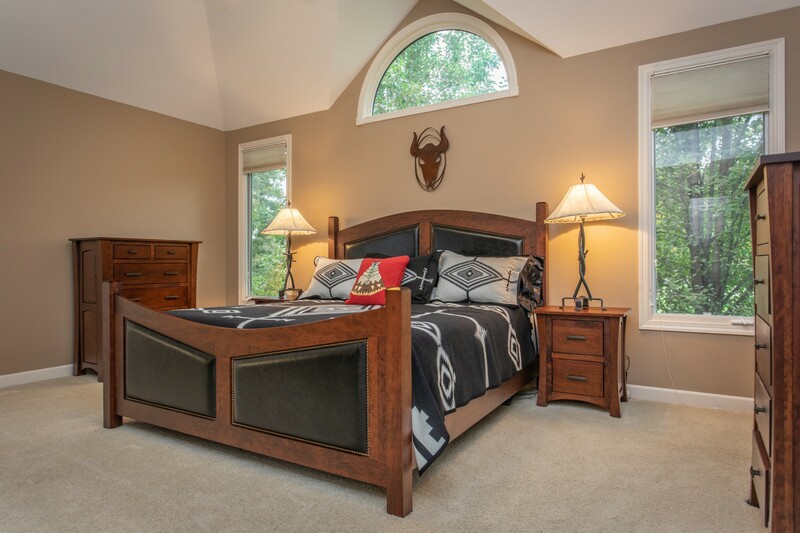 We designed this bed specifically for this client, who loves the aesthetic of the Southwest. The rustic cherry hardwood, with low sheen dark Michael’s Cherry stain, looks gorgeous against this Capri black leather and nails. The bed's curves, but also straight legs help make it a statement piece. 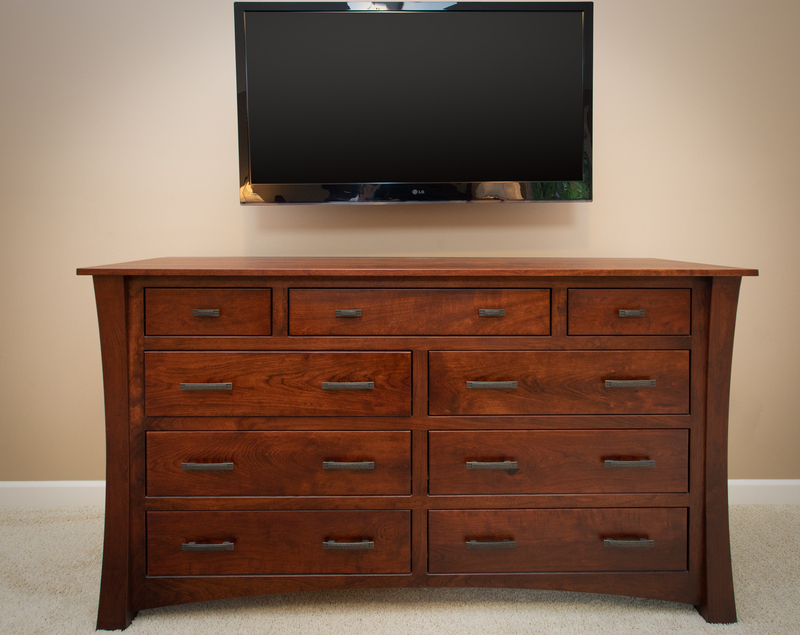 We built our Woodbury Master dresser, our Woodbury chest on chest and our Woodbury 2-drawer night stand with raised panel sides and also in rustic cherry. We slightly customized the drawer configurations to meet the client’s needs. 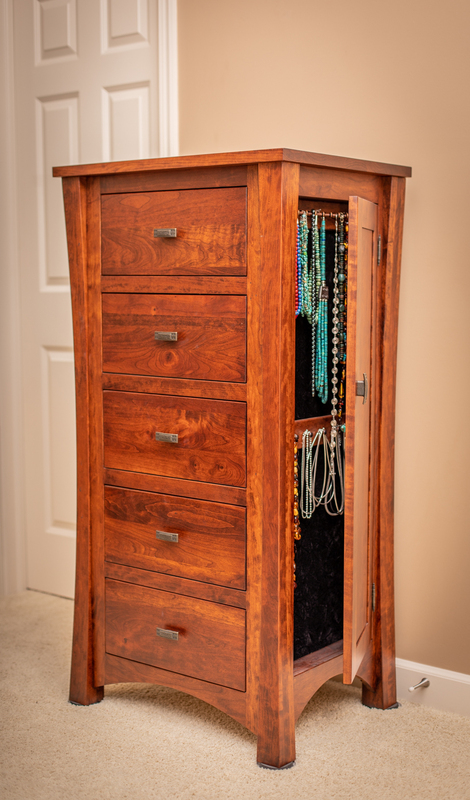 And the custom jewelry chest is based on a combination of elements from both our Canyon Creek and Woodbury collections. 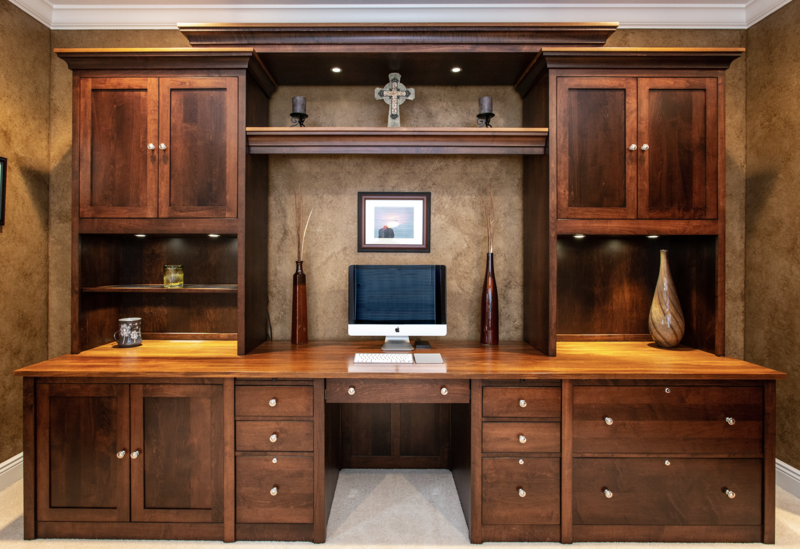 These clients created their home office with us. 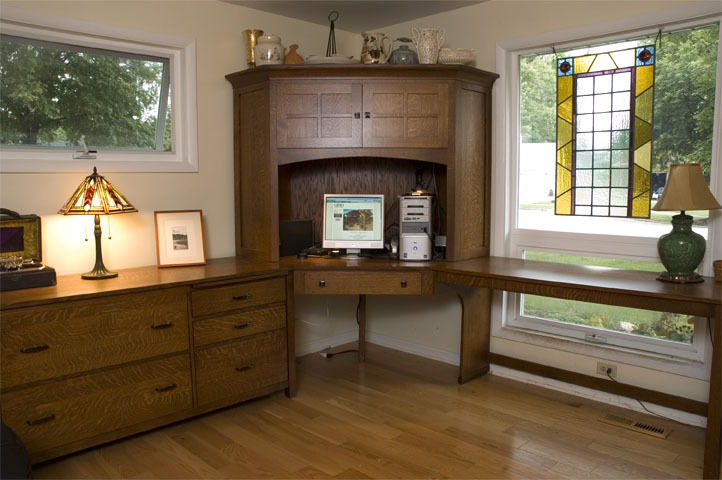 We built this custom L desk in quartersawn white oak wood and Michael’s stain. This design is based off of our 6-Piece Deluxe Corner Computer Center. The client requested the right panel of the desk be left open so that their dogs could see out the window. We also modified the drawers to store the customer’s brass instruments. Our entire Brooklyn collection looks gorgeous in this clients' home. Each piece is hand planed and showcases the rustic beauty of the wood. This set includes two of our Brooklyn 1-drawer, 2-door nightstands, modified 5 drawer chest and our double dresser. 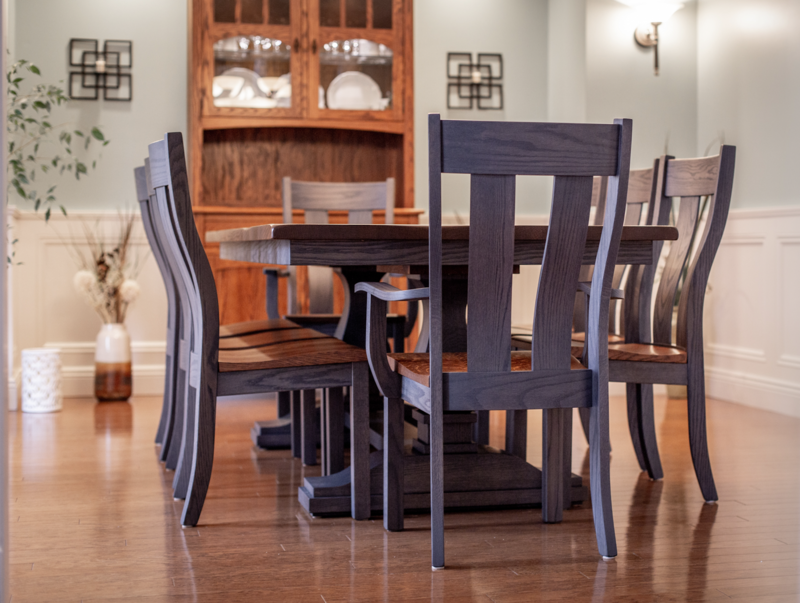 At Ohio Hardwood Furniture, we help our clients blend custom wood pieces with American upholstery to create a lifestyle. These clients had a long narrow space which they wanted to feel open. 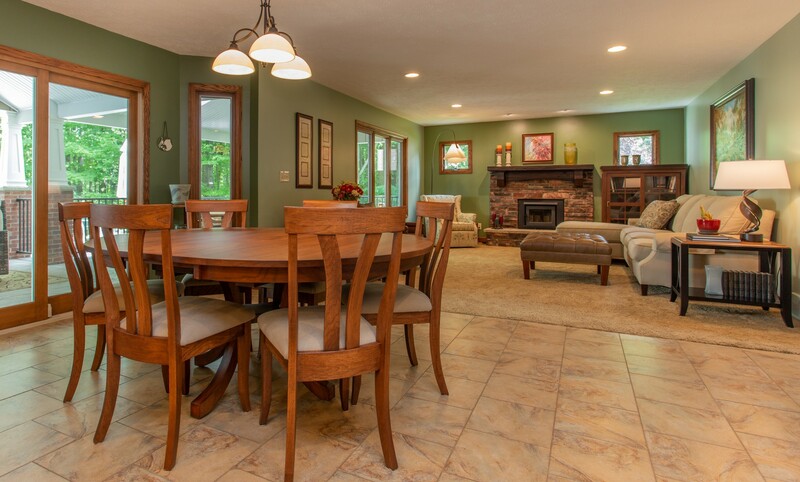 Our Carlisle dining table, built in hickory, splits the distance between their kitchen and living room. The table's 18" butterfly leaf allows for seating more of our Lennox side chairs. Over the fireplace, we built a gorgeous dark mantle using reclaimed wood. Next to it, our Abbie Sliding Door bookcase in cherry wood features a coordinating reclaimed top. Our delicate Millington accent tables fit the graceful aesthetic. Leathercraft's Sutton cocktail ottoman, CR Laine's leather Gotham chairs and Holman Swivel glider, together with Wesley Hall's Campbell sectional and Houston Swivel chair, completely refreshed the space. Stunning American made lighting, Hubbardton Forge's Folio table lamp and Mobius Floor lamp, helped complete the look.